This roster has seen a lot of turnover and replacement, but a lot is still the same, specifically with regards to lines and pairings. Sean Monahan and Johnny Gaudreau will still be on the first line, and Michael Frolik and Mikael Backlund will still be pals on the shutdown line. Matt Stajan and Lance Bouma will be united on the fourth line again. No one is really changing their roles. Except for Sam Bennett, the Flames’ highest ever draft pick. This year will be the first he will play at his natural position of centre. He’ll also have two unfamiliar linemates in Troy Brouwer and Matthew Tkachuk. All these new roles and scenarios are going to be quite the ask, but they’re something that Bennett is poised to conquer. It’s safe to say that Bennett’s rookie year did not go as he would’ve hoped. Scoring proved to be tricky for the 19-year-old, who only scored 36 points through 77 games last year (five of those points coming in the same game). His points totals for such an esteemed prospect were slightly disappointing, though he didn’t get the best opportunities to score. He was mostly with Backlund and Frolik on the shutdown line, and also received very little powerplay or 3v3 time. The former was explainable: the Flames really didn’t feel he was ready to be a centre yet, but too ready to go back to the OHL. The latter was because a now-unemployed coach couldn’t identify areas of the game where Bennett should excel. We all know that talking point totals are not the most truthful way to discuss Sam Bennett’s 2015-16. Every time we saw him on the ice, he was quite clearly holding his own. Arguably, he was even on par with the veterans surrounding him, and the data supports that. 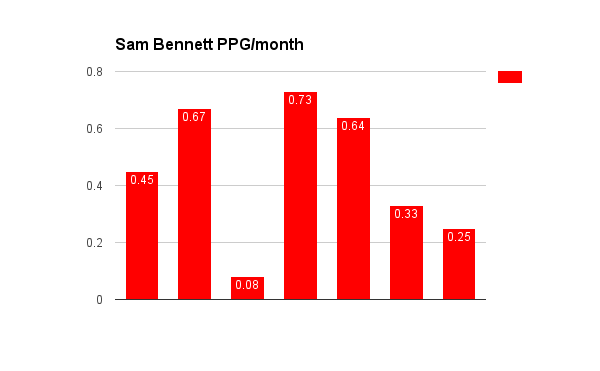 Sam Bennett is going to be just fine. He does all the things that lead to goals being scored – driving play and suppressing the opposition – without actually scoring the goals himself. However, it is still worth noting that he did this with Backlund and Frolik, players who are well known for giving other players piggyback rides. The question for 2016-17 will be whether or not Bennett can succeed on his own. Bennett is being taken off the leash this year. Instead of being a second line winger to the playmaking centre, he’ll have to be that centre. This is how Glen Gulutzan has been treating him in the preseason. Mostly thanks to the top line being out, Bennett has acted as the 1C with Tkachuk and Brouwer on his wings, and it’s a line combination that is likely to stick heading into the regular season. That is our first point of optimism for Bennett’s 2016-17 campaign. He and Brett Kulak are tied for the preseason scoring lead with three points apiece. In three out of four games, Bennett has been a positive corsi rel player (two games, leading the pack by margins greater than +20CFrel%), as well as a minutes muncher. Another thing working in Bennett’s favour is that he won’t be with the defensive line. Gulutzan has already tipped his hand this preseason as to how he will use 19-93-36. They are going to be the offensive power, and they will get the offensive zone time. In three of those four preseason games, Bennett received over 70% OZS starts at 5v5 (including the game against Winnipeg, where he did not receive anything but offensive zone starts). Bennett’s scenario is almost exactly like Sean Monahan’s in 2014-15. Take a second year centre coming off of a very promising first season, add a well hyped rookie on his left and a veteran presence on his right, and then give them the offensive zone time. With Bennett, statistically speaking, being a better playdriver than Monahan we could see an even bigger explosion than Monahan’s sophomore season. Oh, he’ll also get powerplay time too. That’s gonna help. I would place Bennett somewhere in the range of 60-70 points this season. He may even usurp the first line role, but that’s my bold pick. Big season for Bennett this year. Kid’s an absolute monster. Benny can easily be the the Flames’ #1 pivot for the next decade and a half! He along with Tkachuk, Monahan, Gaudreau (if he signs), TJ, Hamilton, etc will carry the club’s weight. Very excited to see Benny being promised more ice time and OZ starts. I look forward to seeing a Johnny-Benny-Tkachuk/Brouwer first line PP. Would cause mayhem all over the opponents zone: behind the net, down low, half wall, in front, in the slot, and at the point. Our PP will be better this year simply because of improved depth in the top-6. Wonder what kind of contract Bennett will be in for with a 60-70 point season? Not quite Monahan money given it’s only one 60 point season vs. 2. Bennett probably won’t go for a long term deal in the 5 mil range. All signs point to a bridge deal on this one I think? I think 70 points is a little high. He may get 50-55 max. Agreed. When projecting Bennett, one has to consider that his linemates (Brouwer and Tkachuk) are probably capped at around 40 points. A center can get to 50 with two 40 point wingers, but getting much further than that is extremely unlikely. On the other hand, if Bennett gets a lot of time centering Gaudreau, things could be interesting. He did that for four games last year and had six points. Bennett playing center with Tkachuk I like. Monahan and Gaudreau – is a fine pairing. I don’t like our 3rd line going forward. If Bouma slots in, we could have a 10million dollar 3rd line! We could have a 5 million dollar fourth line if Bollig plays! No top team is built like this. Our bottom six is very poor value and will be problematic when Bennett re-ups if he has a big year in terms of cap hit. We’ll have to start shipping guys out. Frolik is a fine player. But as good as it is, he and Backlund need to end soon, or they’ll be priced off the team. We have Frolik until ’19/’20. As do we Brower. Brower and Frolik should be given time to see if they mesh as our top two RW with the other combos. If Backlund truly bumps everyone he plays with, then start developing combos this year that will work next year and beyond. If Ferland playing on the top line pulls a Colborne and shoots 19%? Then what another poor value contract next year? Or we just dump him next year and start again with Shinkaruk? We’re shooting ourselves in the foot with these combos that result in such a costly bottom six. Change it or trade out for better value while we can. We need to shed one of Bouma or Stajan at least asap. 2017/18 is going to be the start of our “window” we gotta be thinking for then and the following 3-4 years. You really need to remove the ‘REALISTIC’ from the titles of these entries. I’m more excited about the absolute mayhem Bennett and Tkachuk are going to wreak. In your face, skilled agitators with everything to prove. With enough finesse to leave your jockstraps hanging. if Gulu plays SB as 2nd line center, maybe 1st if warranted, he will get 60 points if all goes well with JG signing and he has good puck possession driving line mates. I sure hope JG is on the ice at the opener in Edmonton’s new barn. My thoughts are Bennett to continue to develop as a center iceman and be between 50-60 points; anything else is gravy. If he scores 25+, Brouwer scores @20 and Tkachuk scores @20 then we will have an effective 2nd line. Have Backs and Frolik @20 and their lw @15 and we will have an effective 3rd line. BobB your concerns about the the Back’s line being overpriced is a bit baffling to me. I’m more frustrated by a 4th line being paid @6m and a third pairing of over $8m. Fortunately the $8m duo will be gone after this year and hopefully so will be one of the overpriced 4th liners. I’m equally frustrated by both the overpriced 3rd and 4th lines. I like Backlund and Frolik. But we’re not the 2004 NY Rangers. I can’t find a successful team that actively builds a ~10million dollar third line (or a 8million dollar duo) getting third line minutes. Then we talk of putting unproven NHL’ers on the top line! There’s only so much money to go around and when Bennett has a big season he’ll command a healthy chunk of it. If we think to the future. The money to the top line, Bennett’s line, a solid young defense after this year and goaltending. An 8 million dollar 3rd line duo is unsustainable.